This Joint Research Project (JRP) aims at improving the measurement infrastructure for key Volatile Organic Compounds (VOCs) in air by providing traceable and comparable reference gas standards and by validating new measurement systems (sensors-based) in support to the air monitoring networks. Some VOCs are dangerous to human health whilst others cause harm to the environment by influencing the oxidative capacity of the atmosphere, contributing to the production of other air pollutants as well as to greenhouse gases and ozone, and by being also involved in the formation of secondary organic aerosols (SOA). This JRP focuses on the VOC key compounds (indicators) that are regulated by the European legislation, that are relevant for indoor air monitoring and for air quality and climate monitoring programmes like the VOC programme established by the World Meteorological Organization (WMO) – Global Atmosphere Watch (GAW) and the UNECE's European Monitoring and Evaluation Programme (EMEP). WMO/GAW and EMEP have set challenging data quality objectives (DQOs) for the atmospheric monitoring programmes. The evidence is that for priority classes of VOCs traceable and stable gas standards are still lacking. Specifically, the priorities of the GAW VOC network are set to oxygenated-VOCs (OVOC), oxidation products from anthropogenic and biogenic origin and to terpenes, biogenic aerosol precursors. In answer to this need, this JRP aims at developing fit-for-purpose gas standards based on novel passivation chemistries to guarantee mixture stability and improved preparation methods. The JRP also addresses the need to develop standards for reactive VOCs that are not sufficiently stable in high-pressure gas cylinders. To achieve this, novel dynamic generation techniques will be designed and constructed taking into account the VOCs’ behaviour to adsorb and react on contact with material surfaces. Measuring VOCs is complex because of their variety, their different physical and chemical properties and their presence in the atmosphere at very low concentration levels ((sub)-part-per-billions). Currently, more than 15 documentary standards on VOCs are published or in preparation by European (CEN TC 264 “Air Quality” and International (ISO/TC 146 “Air Quality”) standardisation committees to cope with the need of measuring different VOCs gaseous species respective of the application and concentration levels. In support to their implementation, an improved metrological infrastructure is necessary to provide traceability to the measurement results and reference materials for the quality assurance and quality control (QA/QC) of the measurement systems. This JRP will investigate reference generation methods and innovative constant emitting reference materials for specific polar and semi –VOCs relevant for indoor air applications. In support of CEN/TC 264 and of ISO/TC 158 “Gas Analysis”, this JRP will also develop a protocol for the certification of VOC-free zero gas standards critical for the measurement of VOC at trace levels and for the preparation of VOC calibration standards. Furthermore, this JRP addresses the need for high spatial resolution measurements to understand ambient concentration patterns with respect to requirements of the EU Air Quality directive (2008/50/EC). In this JRP, it is our aim to carry out a systematic and metrological sounded programme of validation targeted on sensors-based devices for VOCs measurements which have the potential of becoming low-costs indicative methods. In particular the JRP will focus on benzene, a harmful air pollutant regulated by the Air Quality directive. The technical work of the JRP structure is divided into four Work Packages (WPs). The outcome of WP1 will feed WP2 and WP3, two WPs dealing with the development of VOC gas standards respectively for the atmospheric monitoring programmes and for indoor air measurements. Principle aspects covered by WP2 are metrological traceability, accuracy and long-term stability in order to achieve and improve the DQOs set for measurement uncertainties by the WMO/GAW and EMEP programmes. This will be achieved by developing ad-hoc gas standards for OVOCs and terpenes by means of static (gravimetric) and dynamic preparation methods. In addition to that, special attention will be given to the preparation of formaldehyde standards. WP3 focuses on metrological issues related to indoor air. Specifically, the activities aim at providing traceability, by developing gas standards with dynamic methods, and at providing transfer reference materials in the form of sorption tubes and constant emitting materials for polar- and semi-VOCs. 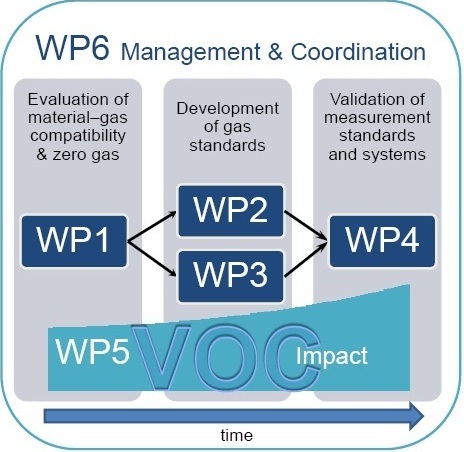 The experimental validation of the gas standards developed in WP2 and WP3 will occur in WP4. The work will consist of conducting two intercomparisons of the reference gas mixtures by means of suitable transfer standards. REG(DWD), a WMO/GAW station most experienced in VOC measurements, will participate to the validation of the atmospheric monitoring gas standards, ensuring the dissemination of the JRP results to the WMO/GAW VOC network. WP4 will also cover the validation of commercial sensor-based VOC measuring systems. The work includes the review of the existing measurement systems, the development of a testing protocol and calibration procedures and the laboratory and field validation. The final goal is evaluate the possibility of VOC sensor-based devices to be used as indicative methods (measurement uncertainty lower than 50 %) in air quality monitoring.